A noir game where a vampire drives a taxi in the streets of New Wenders. You play as the taxi driver, and get to talk with the passengers through a series of branching dialogues. Ultimately, you can choose whether you want to take them to their destination or feed on them. All 3D models are from Quaternius. You can get them for free on his website and support him on patreon. At first I decided to add keyboard control to make testing easier and faster (also tendinitis), but then I realized it might actually be a better way to play rather than using the mouse. 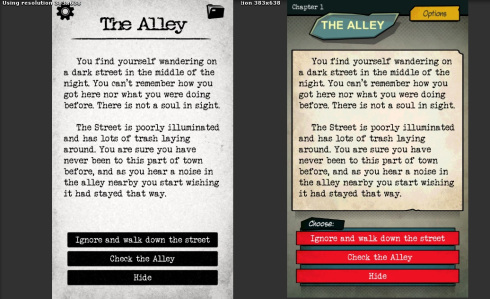 For the regular gameplay, you can advance pages with the left and right arrow, and make choices with numbers 1 to 5. The white font on the third choice means this option was already selected on a previous play-through, since the game has many different paths, I thought it would be nice for the player to visualize which options are new to him. The SPACE key has a different function depending on the context. In most places it will act as a mouse click (advancing a dialog cutscene, maximizing/minimizing an image), but it is also used in the minigames. By the way, if you played the demo version, you will notice that the minigames are now linked to the relevant attributes, so they will be harder or easier depending on the value of your attribute. And of course you can access the Map (M), File (F) and Options (O). Besides that, I’ve also started working on polishing some aspects like adding fade in/out and adding some animation to tape-covered text. That’s it for now, hopefully will have more information on release date soon, for now you can wishlist Blackout on Steam or pre-order on itch.io! Adding “cutscenes” for some images. Still WIP. The effect is quite easy to achieve, it’s just four separate cameras with render textures. June report! Blackout, Twine and #Godotjam! Between E32018 and the World Cup, June has been a month full of distractions, specially since I make my makes on my free time. Despite that, I still managed to get a good amount done, and a very important part of Blackout, even though it might not be the most exciting: text revision. It has been a long time since I wrote it, and some of the later chapters have never undergone a true revision. In order to make this task easier I decided to change the tool I was using to keep the text, which wasn’t really a IF tool, it was just google docs, which is better than what I used when I originally wrote the story: two small notebooks. So I decided to move the story from google docs to Twine, even though I’m not using twine for the game implementation itself (I’m using my own framework, which I’ll go into more detail on next month’s post) making it easier to have a good overview of the flow of each chapter, easier to find a passage and also easier to test. This is a chapter from Blackout, you can see how chaotic and non-linear it looks, even though in this specific chapter most paths end time leading to the same exit (wide boxes are the end point, and each of them leads to a different chapter). Even though a direct path through the chapter might be short, there are several different ways of approaching every situation. This chapter has almost 8k words, if you’re the type that is interested in numbers, this is the average for most chapters, some are bigger and some are smaller. If you played through the preview that is up on itch.io, you saw that the writing style is very simple and direct, I want the player to move fast through the story, and do this several times over, so it can’t be some Tolkienesque thing where I describe every small rock on the way. On other news, I also took some time on a weekend to participate in the Godot Community Jam. I tried Godot for the first time earlier this year in another game jam and liked it a lot, so I wanted to get more practice, and I thought game jams are probably the best way to achieve that right now, given the small amount of free time I have. I ended up making a very simple game, in roughly 8 hours. The theme of the jam was Temperature. You can check all entries here. That’s it for June, I decided to start making this monthly report because one of my goals for 2018 was posting in the blog more often. For the next post I’ll try to go a bit into the framework I’ve built (and am still building) for Blackout. In this article I will be sharing my experience using the Pay What you Want model in a mobile game. The game I tested on is called Sheep Dreams Are Made of This, a story driven platformer/runner with unusual mechanics and a weird vibe. A user review on the store described it as “a mix of Catherine and Cannabalt”, and I like to think it’s on point, Catherine was actually an influence since I was playing it while working on the initial concepts for this game and it made me realize the whole dream/nightmare thing would fit the mechanics I had in mind really well. Plus, I’m a huge fan of Neil Gaiman and H.P. Lovecraft, so the theme really interests me. Sheep Dreams was a project I sat on my drawer for more than a year, we (me and one friend) began working on it with the idea of it being a “one weekend” project, but we worked on it for one day and never touched it again. Got busy, contract work came up, that sort of things. It was supposed to be a small game from the start so we actually did a lot of the work on that one day: animations, background, level design and most of the mechanics. I really liked the idea of the game so one year later I decided I would finish it and release it. The artist was busy at the time so I took upon myself the stupid idea task to do everything else that was missing, including the art. The elevator pitch goes something like this: Sheep Dreams Are Made of This is a looping platformer about recurring nightmares, you control a man that wakes up in the same nightmare, every night, for the past 16 years. As you navigate the labyrinth levels you collect memory fragments that help the character remember things about his past, and your goal is to collect them all to uncover what has been causing the recurring nightmares, but you have to do it before he wakes up. When I sat down to start this game, my initial goal was simply to try and make a game with no death and no enemies. An endless runner seemed like a good option, and later on turned out to work really well with the recurring nightmare theme. As I was finishing the game I decided it needed something to make it more compelling. I was dabbling with the idea of a time based mechanic from the beginning, so I thought it would be interesting if the game had a time limit of 8 hours, representing a full night of sleep. This would be 8 hours of real time, so it would count even with the game closed. Not only it made a lot of sense given the concept of the game, but it also would make players stick with the game a little longer and present more of a challenge. Of course some people did not like the idea (I’ll get into details later on) but they were far fewer than I expected. Finishing the game ended up taking a little more time than I expected (as it always does), but I was satisfied with the result. It wasn’t looking as cool graphically as I initially hoped, but I was happy with the camera tricks, and the very happy with how the story turned out. Here’s how the game looked upon launch. The original trailer is still up if you want to check it. If you look close you will notice what elements I drew (platforms, doors, cubes…) because they don’t look as good as the sheep and the background. I thought it was good enough since the main thing about the game was the concept and story, and I was really curious to see if the mobile audience would like something like this. I decided to publish the game initially in two places: itch.io and Windows Phone. Itch.io because I never released a game on PC and I wanted to get some experience, also makes it easier to show the game to other devs and get feedback. And windows phone because I had a great experience with my previous game, great community and all. Why not release on Android and iOS as well? I was still very unsure about this project, specially on mobile where players are more casual, I thought everyone would hate a game that was trying to tell a more deep and serious story. So this way I would able to test it first. But I still had a big problem: monetization. How the hell do you monetize a story driven endless runner? There are no power ups, no coins, no costumes. I only want the player to experience the story with no hurdles. Ideally this would be a $0.99 game, but I was sure that would flop, releaseing a paid mobile game without being known is tough. I bet Simogo would be able to get away with it, for instance (they are my favorite mobile dev btw). So as I was getting to know itch.io better I saw the “suggested donation” thing, and I really liked that, that could work. But how would I do that on mobile? Would App Purchase work? After a bit of research I found out that you are not allowed to get donations inside an app, if you are selling an IAP you have to give something to the player, otherwise your app will be refused. So I went back to the model I didn’t really want: ads with IAP to remove it, but instead of charging a flat $0.99 I gave the option of paying $0.99, $1.99 and $2.99. I also tried to make the ads not very intrusive, I did not want banner ads, so I chose to show full screen ads every once in a while, after the player goes through a door and a story bit appears, since the game is paused on that moment. So I published the game and started the usual facebook/twitter/email marketing. I really did not expect the mobile audience to be on board for the story, but I was really excited reading the reviews because people were really into it! I also got a lot of 1 star reviews saying the game was depressive or “don’t play this game if you’re feeling down”. I really don’t mind that people give it a bad rating, knowing that the story had such a string impact is more important for me, even if it made the person stop playing the game. Touch Arcade later used the headline “Sheep Dreams Are Made of This has a clever pun and a crazy gimmick”. It was the first time I got the attention of a big iOS website, and I think the name played a big part in getting their attention. My previous game had a very generic name that probably did not help at all (Tap Master Mondrian), e the following game I released also had this problem (Snap Quiz Challenge). They were also targeted to more casual players, but I think a better name would have helped them. I lost count of how many people made jokes quoting the Marilyn Mason song, and many people complained on the reviews that they wanted the song to be in the game. I tried using the “exclusive to windows phone” tagline when I release Sheep Dreams, since my previous game did much better on windows phone than iOS and Android. And this worked really well with the community, they loved to have a game that could not be found on the other systems, and it also work with the mobile sites focused on windows phone, most of the major ones did a piece on the new weird game exclusive to windows phone. The game also got some small features on the windows phone store. Too bad windows phone did not have a ton of users, and by this point the ad revenue decreased by half if compared to when I launched Tap Master. This one was also a big experiment. I thought I’d make this a “silent game”, since it’s very common to have dreams where you can’t hear anything. There was even a point in the game where the characters points it out in one of the sentences that appear when the character enters a door. Of course it also made it a lot easier to make the game because I did not have anyone to make the music and sound effects, as I mentioned before, I was making this completely alone at this point. What happened is I got a lot of 1 star reviews because people thought it was a bug! Later on I added music and sound effects, and of course it made the game much better. Still got some 1 star reviews complaining the music is repetitive. Oh well. I had this “great” idea of making the menu playable, so the character would have jump on the specific platform if he wanted to rate the game, see credits or buy the IAP. That’s terrible. You really don’t want to make it hard for people to buy your damn game, or rate it. Looking at the average review score after one week or so I realized the game was rated considerably lower in countries where Spanish is the native language, compared to English and Portuguese speaking ones. The game launched in English and Portuguese, and since the main element of the game is the narrative, it makes sense that people that don’t understand the language won’t like the game. Other places like Germany, Russia and China had also a good rating average, probably because most of the population understands English. On a later update I added Spanish localization, and sure enough the average rating for those countries went from 2.5 – 3 to above 4! The 8 hour time limit was not made very clear inside the game, specially when the time ended, it would just go back to the menu and reset the game, so once again people thought it was a bug that was making them lose all their progress, and there came a lot of 1 star ratings. After seeing how the game was received, specially how people resonated with the story, the original artist was excited about the game and decided to work on the art elements that were missing (the ones I had do draw) so we could make the game more presentable for release on iOS and Android. We also added music and sound effects. Everything was set for launch, I posted the game on TouchArcade “coming soon” forums and something I did not expect happened: they wrote a post about the game. It was a very short post, but even so it made me stop and think, because it was the first time they posted about one of the games I’ve worked on. At this point I really considered making the iOS version paid, since I would get a bit of visibility from TouchArcade at launch (and looking back I wish I did, more on that later). People suggested I should find a way to include a power up of some kind, something to help the user, make the game a bit easier. Took me a while, but I ended up finding a good solution. So the game has this 8 hour time limit, the “gimmick” touch arcade mentioned. I thought it was an interesting experiment to have the game “last” for 8 hours, I wanted to see how the people would react. Of course not everyone liked this, and some people didn’t even understand (to be honest in the first version it was only explained well in the game description, and who reads that?). So I came up with the Alarm Clock. When your time was up, an alarm would ring and the screen above would appear. The player would have the options to “snooze”, limited to 3 times, where the player gets to play 10 more minutes, or to get some sleeping pills . The sleeping pills being an IAP that would remove the time limit (the character would keep sleeping indefinitely). I thought it was clever, of course some people complained it was a ripoff, that the time limit was there just to force them to buy the IAP. But some people really liked that they could finally play on their own pace and finish the game, it ended up being the most popular IAP in the game, because that was the thing about the game, people got really curious about the weird story and they really wanted to know that happened: what the hell did this guy do? Where is this going? In some ways the launch went better than I expected, at least on iOS. It had almost 5k downloads on the first few days, which was much more than my previous game. But on Android it was a rough start, since almost no website had something about the game. At some point (more than 1 year later) the game was featured on China for iOS, it was a very small feature, but the numbers are interesting, I wrote a post about it sharing the numbers. There were no sales of IAP though. We also updated the windows phone version with the new graphics, of course. Very slowly android numbers kept growing, but it wasn’t until december 2016 that they really kicked in, and I still have no idea what happened. The app had around 3k total downloads at this point. It jumped from around 200 downloads a month in november to 1.200 in december, almost 6k in january and 13k in march, which was the best month. As you can see on the acquisition report below, most of the downloads were coming from organic views, and from Brazil (my home country). I couldn’t find any features, so I really don’t know what happened. Through 2017 and until February 2018 the game averaged 3-5k downloads per month, which I thought was very good. Then, as quickly as they came, they went away. Coincidentally, as the game reached 100k lifetime downloads, the average daily download came down from 100 to 10. I guess maybe when the app changed to a new tier of download (in this case 100k-500k) it affects the app position and visibility on the store, but I thought it would affect for the best. Ok, so what about the “Pay What You Want” numbers I came here for? I had 3 tiers of price, $0.99, $1.99 and $2.99. Looking back now, I could have made the difference a bit bigger. What happened is very few people bought the middle tier. People either paid the minimum to just remove the ads or they really liked the game and paid the highest. That’s why I said maybe I could have made the tiers further apart, people who liked the game were really into it and wanted to show their support. Something like 0.99/2.99/4.99 could have worked better. So, in the end, would I recommend “Pay what you want”? For most cases, yes. In my case, this increased the revenue in 37%, compared to if I had just charged the regular $0.99. Of course this will be different for every game, if I had tried this on the Quiz game I released later on, I’m sure this % would have been lower, because it’s very casual and has no story, so it’s harder for the player to be attached. If you ever tried anything similar, please let me know how it went! If you have any other questions about number or stats that I did not include, get in touch on twitter @robsonsiebel or leave a comment below! It took way longer than I expected to finish this updated due to the fact that I was moving to another country and as you might imagine that takes quite a lot of time and effort. But now about the game. If you played the previous version of blackout you probably noticed id had a 3by4 aspect ratio (aka iPad), because Blackout began as a mobile project. We have since then decided to change it to PC, in part due to the great feedback we got here on itch.io. To do that, we redesigned the whole in-game menu and character file. We also updated all the textures in order to have a more unified look and higher resolution. What I think added a lot was the new “Folders” to represent the character file and options, as well as the Map. For this version the map is a placeholder, but in the final version you’ll be able to see the location you’re at and get some information. I hope you’ll enjoy the update, and meanwhile we’ll continue to work to finish the game. This is the first chapter, the final game will have 10, but which chapters you’ll see will depend on your choices. We have a newsletter you can subscribe to keep up with the development or if you are interested in participating in out future beta test.